The following lists the known Gym badges that have appeared in the game and/or anime series, along with additional information. The Indigo League is the local league in Kanto. A total of eight badges must be obtained to challenge the Elite Four (game), or participate in the League (anime). The following are badges from the Kanto region. The Boulder Badge (グレーバッジ Gray Badge) is given out at the Pewter City Gym, held by the Gym Leader, Brock. Abilities: The Boulder Badge allows for the HM Flash to be used outside of battle. Additionally, it will raise the attack stat of the player's Pokémon. The Cascade Badge (ブルーバッジ Blue Badge) is given out at the Cerulean City Gym, held by the Gym Leader, Misty. Abilities: The Cascade Badge allows for the HM Cut to be used outside of battle. Additionally, it will allow for Pokémon up to level 30 to obey their Trainer. The Thunder Badge (オレンジバッジ Orange Badge) is given out at the Vermilion City Gym, held by the Gym Leader, Lt. Surge. Abilities: The Thunder Badge allows for the HM Fly to be used outside of battle. Additionally, it will raise the speed stat of the player's Pokémon. The Rainbow Badge (レインボーバッジ Rainbow Badge) is given out at the Celadon City Gym, held by the Gym Leader, Erika. 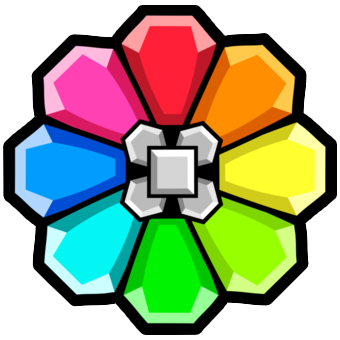 Abilities: The Rainbow Badge allows for the HM Strength to be used outside of battle. Additionally, it will allow for Pokémon up to level 50 to obey their Trainer. The Soul Badge (ピンクバッジ Pink Badge) is given out at the Fuchsia City Gym, held by the Gym Leader, Koga. In Pokémon Gold, Silver and Crystal, the Gym Leader and the one who gives out the badge is Koga's daughter Janine. Abilities: The Soul Badge allows for the HM Surf to be used outside of battle. Additionally, it will raise the defense stat of the player's Pokémon. The Marsh Badge (ゴールドバッジ Gold Badge) is given out at the Saffron City Gym, held by the Gym Leader, Sabrina. Abilities: The Marsh Badge allows for the HM Rock Smash to be used outside of battle, but only in the FireRed and LeafGreen games. Additionally, it will allow for Pokémon up to level 70 to obey their Trainer. The Volcano Badge (クリムゾンバッジ Crimson Badge) is given out at the Cinnabar Island Gym, held by the Gym Leader, Blaine. Abilities: The Volcano Badge allows for the HM Waterfall to be used outside of battle, but only in the FireRed and LeafGreen games. Additionally, it will raise the special stats of the player's Pokémon. The Earth Badge (グリーンバッジ Green Badge) is given out at the Viridian City Gym, held by the Gym Leader, Giovanni. In Pokémon Gold, Silver and Crystal, the Gym Leader and the one who gives out the badge is Blue. Abilities: The Earth Badge is the final badge in the game, and upon receiving it, the player can challenge the Elite Four, or in the anime, participate in the Indigo League. Additionally, it will allow for all Pokémon to obey their Trainer. In Heart Gold/Soul Silver it allows you to use the HM rock climb outside of battle. Copyrights © 2011 Tommy's Pokemon Ingenious. All Rights Reserved.